I'm giving in to old age and smaller income level with the two vintage rides I cherish. Both of my two steel wonders are going to be switched to clinchers from sew-ups. Looking for suggestions for rims to use, if you would please. Square profile, no v -type or deep alloy, much less a carbon fiber, is going on these two. Details, No. 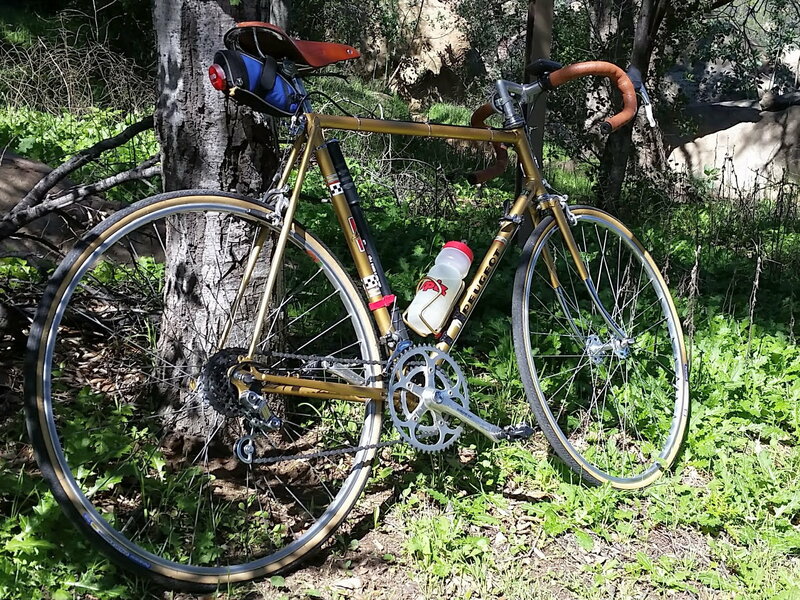 1, 1986 Tommasini Prestige, AiR chromed fork, pink colourway. 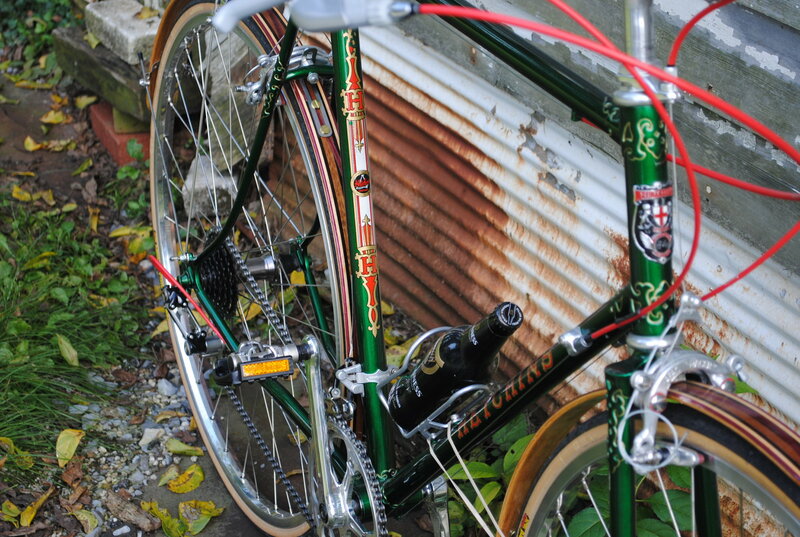 No 2, 1980 Medici Pro Strada, no chrome socks, deep green colourway. Both are low flange Record hubs, 36 hole, 5- or 6-speed capable for both hub-sets, running five cog Regina Extra on both. 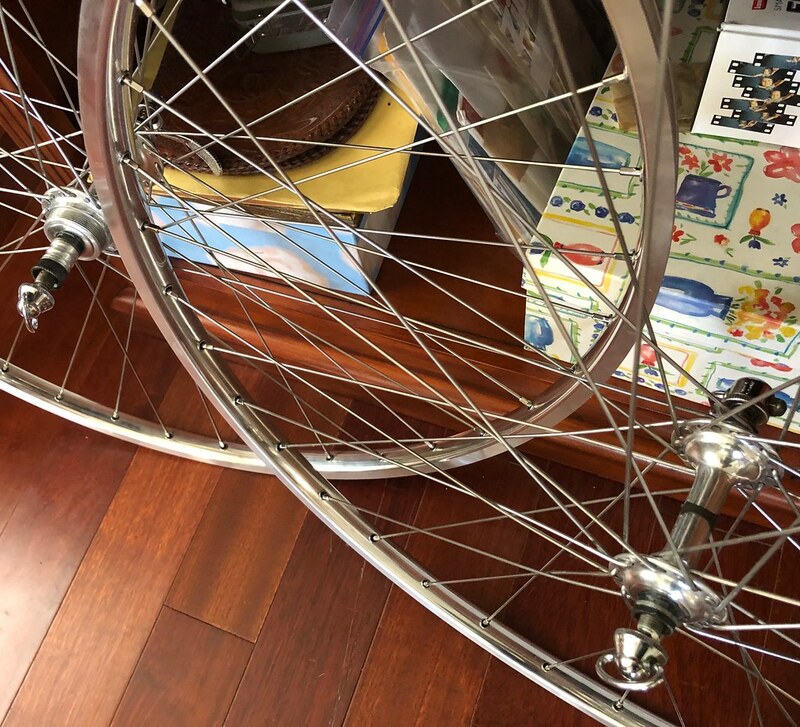 Looking to use the hubs, and spokes if possible, with the new rims, but I will purchase fresh spokes to properly fit the right rims. Width wise I am planning to go no wider than 25 or possibly 28, if they fit stays and forks. 700c hoops, not looking to fall down the 650b or 27" rabbit holes for now. Silver colored, no black or anodized hoops desired. Sun m13ii from ebay (or similar) and Sapim Race spokes from danscomp. Use a razor to remove the ugly "m13ii" half from the rim label. Keep an eye open for good used rims, or NOS rims or wheels. They pop up frequently, and could be much cheaper than buying/building new. If you get whole wheels, then you can keep your original wheels (or sell them on). Velo Orange sells a few rims that would match a vintage bike quite nicely. Lots of changes racks fenders, stem. I thought the Celeste fenders would be cool but then I didn't like them. I third the TB14s, especially if you're going to be building them yourself. They are very true and easy to work with. I'll be building them myself, thanks for these suggestions so far. I like those Sun that BG has posted, and the others look promising too. 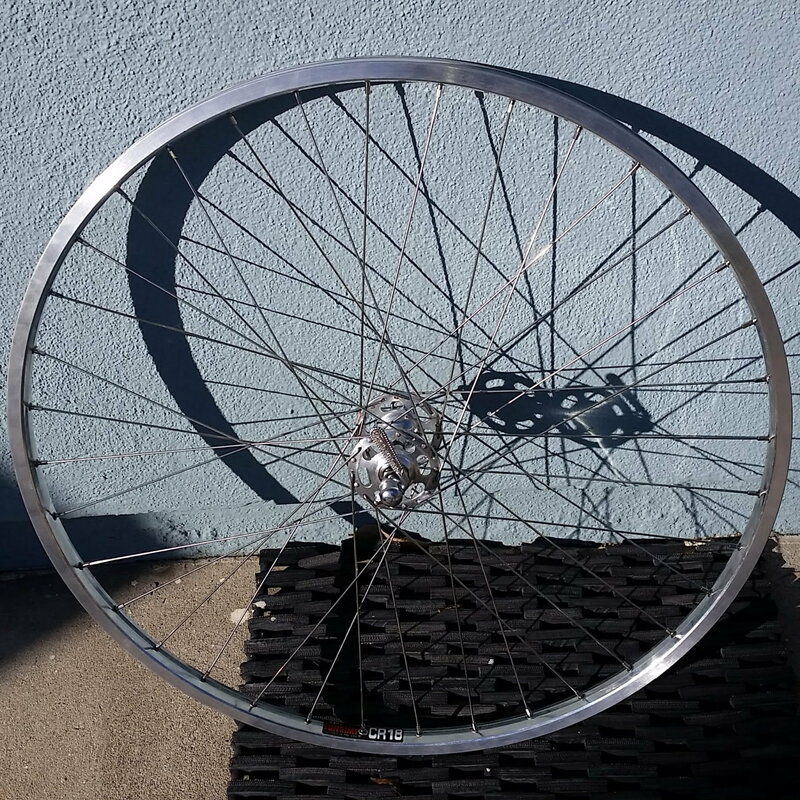 The thought about watching for some vintage rims was my first thought, its how all of my tubulars have been built to date. No problems with using some old rims, as long as they pass inspection of course. Keep the ideas flowing, I appreciate the input muchlys y'all. I just had a set of CR18s laced to a pair of Legnano branded high flange Campys. I did a 46 mile ride on Tuesday, even hit a 4 inch California pot hole, and the wheels are still round and true. The brake tracks are kind of tall compared to most vintage rims, but the improved braking from clean straight brake tracks is appreciated. At $71 per pair, shipped, I'm very happy. The logos are kind of big, but are easily removed stickers. They work very well with Pasela 28s. Pacenti's Brevet rims have a nice rounded box section and are clear anodized (look polished). They're around 450g. Their width allows skinnier clinchers to puff out and feel more cushy, much like the H+Son TB14. The Sun M13II mentioned upstream are inexpensive but very much in the style of the Rigida 1320. So about the same weight as the above two, but narrower, especially between the bead hooks. Of those, it's possible that the M13II would build up on the same spokes as your old tubular wheels, but I won't guarantee it! Last edited by ThermionicScott; 03-21-19 at 07:47 PM. 490 grams per rim is wagon wheel territory. Welcome back!! I hope your doing well? Hi, Bill! Welcome back. Good to see you around again. CR-18s are great rims to put on a wheel that will be under a lot of stress (poor road surfaces, a heavy rider, or carrying an extra load). The other, lighter choices are fine also. I've built one set each of the M-13's and the TB-14's, but haven't put a lot of mileage on them. Both were relatively easy to work with, and I didn't have any issues fitting relatively high-volume tires on them. 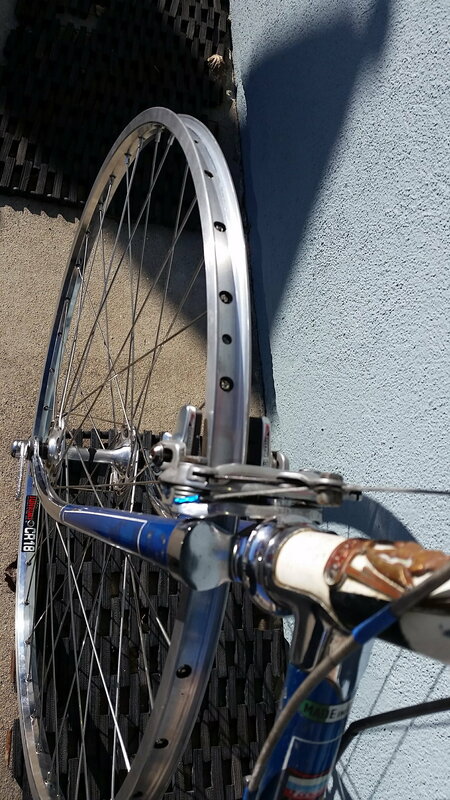 Vintage clincher rims (70's and before) will generally be weaker than modern rims, and often had no bead hook, so are not suitable for higher pressure tires. Used 80's clincher rims would probably be fine. 1.) My 81 Pro Strada won't fit 28s between the chain stays. So check first. 2.) Most any clincher rim will want shorter spokes than what you have (but you probably know that). I vote for Open Pros or Ambrosio rims. Cerchio bici: Ambrosio Excellence - Ambrosio Wheels Excellights will be my next clincher rims. 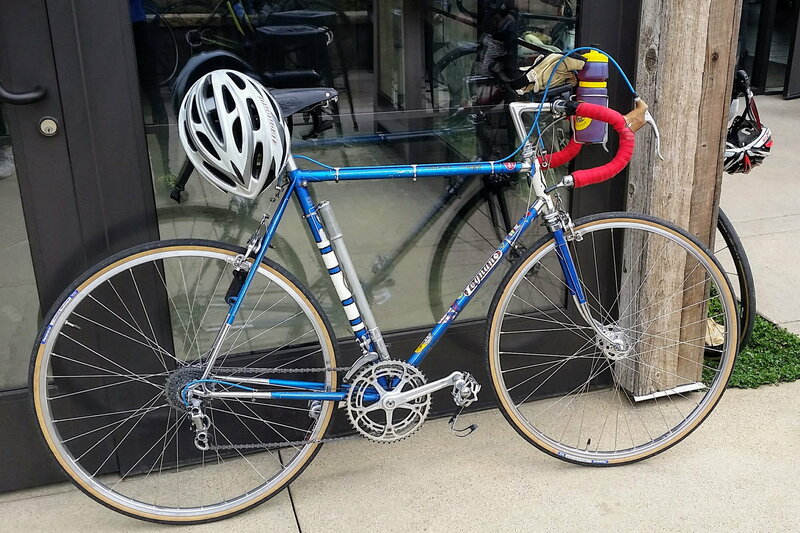 I suppose you can get used to wider rims on your 80s racing classics, but I think they are more appropriate on older or all purpose bikes for even wider tires. Shouldn't we have pictures of this Tommasini and Medici? Except for some light consulting, I'm retired! As far as rims go, I'd look for used Mavic GP4 if you like tubular or MA-40 if you like clinchers. I've had good durability with both types. They are both dark anodized, but are contemporary with your bikes. My experience in exchanging GP-4 wheels with MA-40 wheels is that the brakes do not even have to be re-adjusted. The GP-4s are very rugged, having been designed as training rims. Both weight about the same, 430 grams each give or take. 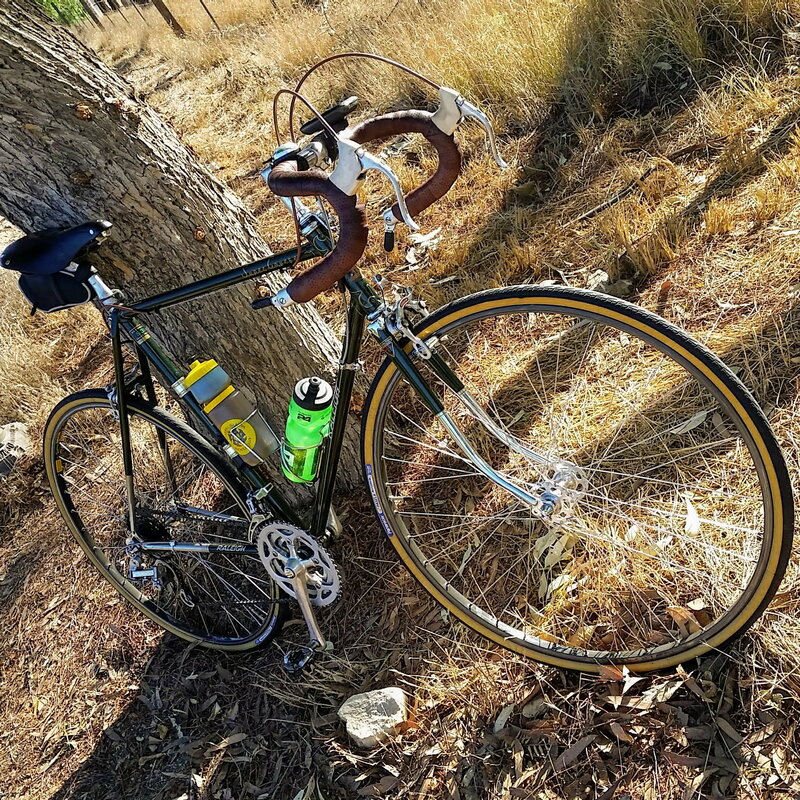 I have three frames of that vintage (or a little later), 1980 Masi, 1984 ish Mondonico, and 2005 Mondonico, and they can all accept 27 mm tubulars using those rims or compatible ones. Careful with the "5/6" idea. 5-speeds with their standard chains were originally for 120 mm frame widths, and 126 mm was to accommodate making a 6-speed by just adding another cog with the same width of chain. You can put a 5 on a bike with 126 mm OLD, but not the other way unless you are using a so-called Ultra-6 type of cassette and a narrower chain. In Campy, the hubs were the same except or a longer axle and longer QR. The built wheels have more dish in the 126 mm configurations, but the same chainline specification (41.5 mm?). They sound like good projects! Those Excellights look very Open Pro-ish. 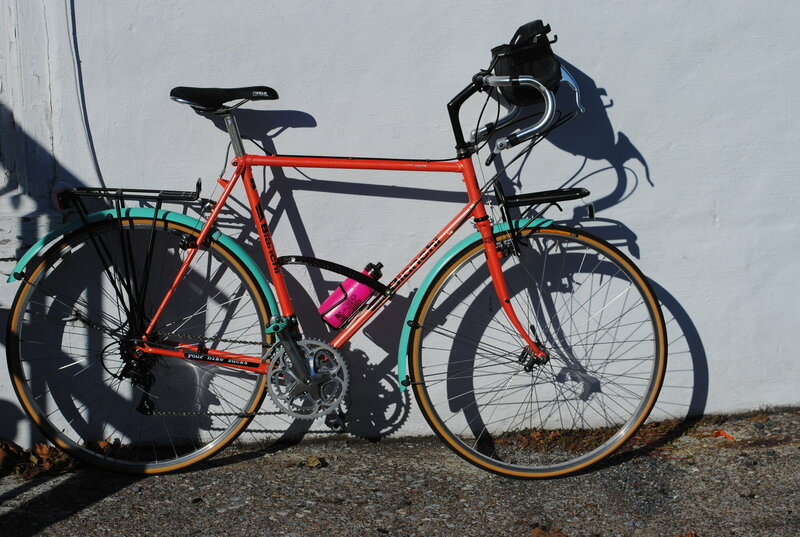 A dyed-in-the-wool Bianchi fan recognizes that as a color, Celeste does not go with everything! Good to see you here, Bill. CR18 rims are high quality but heavy. That may or may not matter to you. Dooohhhh! I just read your title! So let me amend my recommendations, to: If you want vintage rims, look for the Mavic MA-40s. In new product I have good expereince as well with the Sun CR 18, though it is wider (18 mm rather than 14 mm). The newer Mavic Open Pro, Sun M13, and most other clincher road rims are 14 mm or 13 mm width. The CR-18s will require a wider brake setting. No experience here with the H Son products, but I do not prefer a heavy look on wispy-looking road frames. For what your going to pay for a decent wheelset you could probably buy 3 sets of decent tubulars. Merlin in the UK have the best prices. I would stick with the tubs. You won't find a clincher that rides as well as these Veloflexes. Last edited by Wileyone; 03-22-19 at 02:40 PM. Besides the CR18s on my blue Legnano above, I second the MA40 recommendation. I have the dark anodized ones on my Raleigh, and the red diamond labels on my Peugeot. I wasn't sure about the dark anodize, but got the wheels free from a good friend, so I couldn't refuse. They do look good with the dark bike and Paselas. I was leery of Mavic, having had cracks around spoke holes on a 2007 Roubaix with OEM Mavic Open Sports, but so far so good with the MA40s. I have over 2500 miles on the Raleigh including a couple of gravel rides with no issues.